What is the best method of ensuring consistent input and viewing of such characters works across the board, is there a particular font family or Unicode code that will enable portability across my devices, and is there a simple way to insert them, possibly via text expander or autocorrect if they are not on the main keyboard? The good news is that this part should almost always 'just work' on OS X and iOS devices. Encodings are usually handled intelligently, Unicode fonts are installed, and font substitution does its job. If you do encounter problems, be sure to specify the encoding as Unicode (UTF-8) when saving. If your text editor doesn't allow you to specify an encoding, it's a fairly safe bet that this is what it's using. Since Markdown files are plaintext, you don't have to worry about fonts. If you are using rich formatting, though, Lucida Grande, Arial Unicode, and Apple Symbol are all good options. But, again, OS X and iOS generally switch to another font seamlessly when the main font doesn't support a character. Both OS X and iOS include built-in text replacement tools that will let you insert your symbols easily. 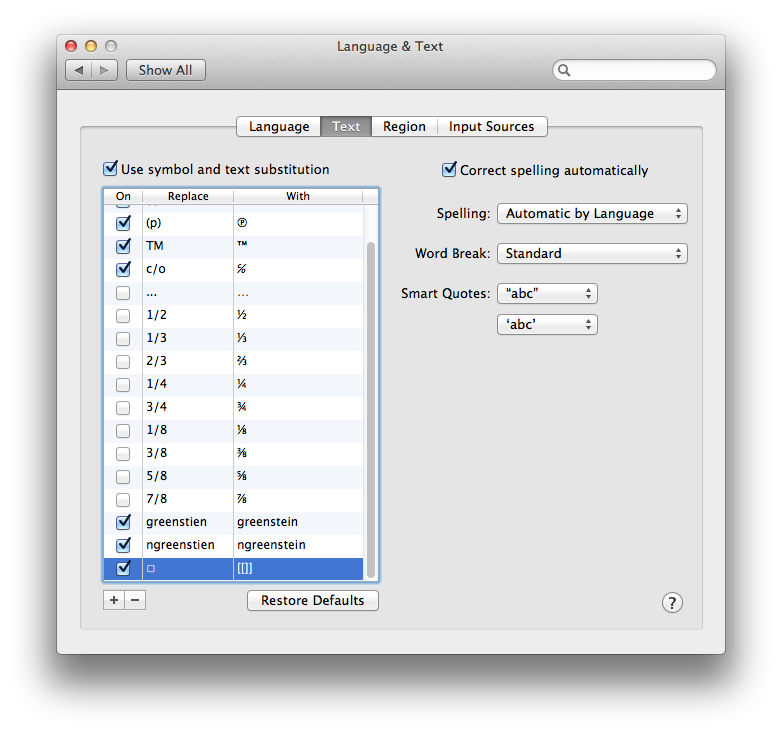 Open System Preferences-> Language and Text-> Text and click the [+] button. Choose a keyword to be expanded and paste in the special character. You'll have to create snippets with unique keywords for each character. Copy a special character. 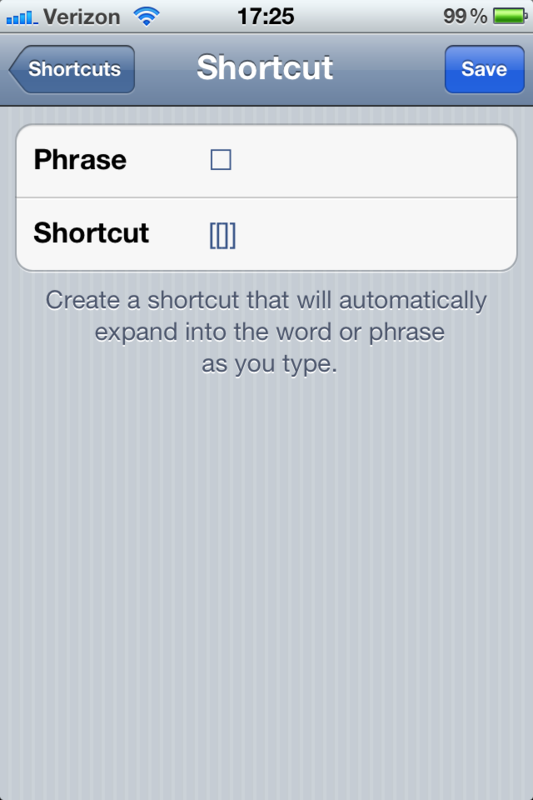 Open Settings-> General-> Keyboard-> Shortcuts and tap the [+] button. Paste the character under Phrase and enter a unique keyword under Shortcut. Tap save. Again, you'll have to create snippets with unique keywords for each character. If you like, you can use the excellent TextExpander to do the same thing, but it isn't necessary in this case. For that task, I usually take two routes depending on the complexity of the task. To simply input a character, I'd use Uklele to remap the keyboard. But if the task requires more than just the input of a character I'd add/modify ~/Library/KeyBindings/DefaultKeyBinding.dict which uses Cocoa Text System to bind certain keys of your choice to operations available to all Cocoa Text System based apps. You can run a search on google for DefaultKeyBinding.dict and you'll find lot's of resources to explain the operations. Regarding the fonts, I think Lucida Grande has many of those special characters on OSX. Whatever character you choose, you can see a list of font based variations of it in the Character Viewer if you expand that window. Note that this floating window does expand without the display of the windows resize mouse pointer. Not the answer you're looking for? Browse other questions tagged macos ios character . Is it possible to add a symbol to the character palette?